The sixth Financial Fitness Forum will be held on Saturday, March 24, at the SMX Aura Convention Center in Taguig City, 1 to 6 p.m. Gates will open at 12 noon. Organized by the Financial Planner Philippines, the forum aims to educate and motivate people to become financially fit. The forum aims to answer frequently asked questions about money, savings and investing and help the audience learn the basics of financial management. 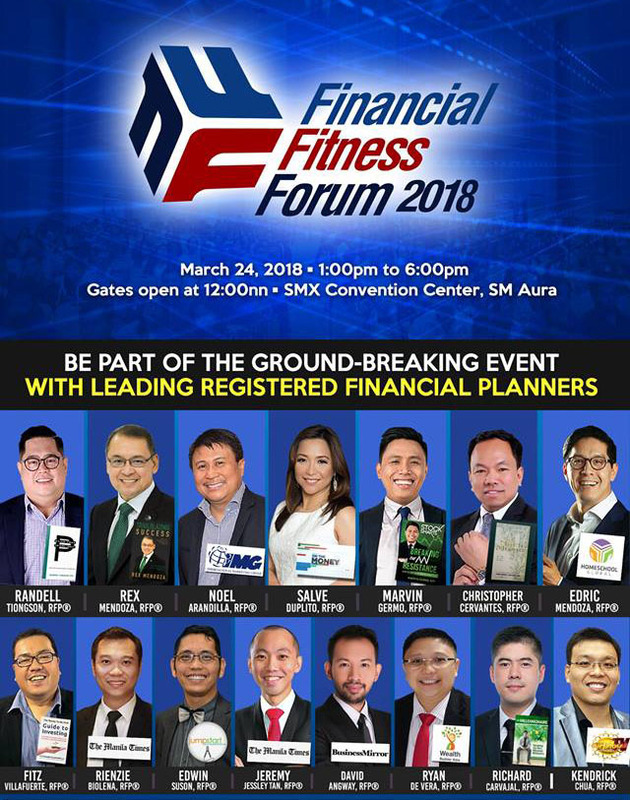 The sixth Financial Fitness Forum will be led by some of the country’s leading registered financial planners (RFP), including Randell Tiongson, bestselling author of Build Your Future Today; Rex Mendoza, bestselling author of Trailblazing Success; Noel Arandilla, co-founder of International Marketing Group; Christopher Cervantes, bestselling author of Seed Money; Fitz Villafuerte, bestselling author of Guide to Investing; Marvin Germo, bestselling author of Stock Smarts; Salve Duplito, anchor host of ANC On The Money and Edric Mendoza, president of Homeschool Global. Other RFP advocates will also join the discussion, including Edwin Suson, founder of Jumpstart Your Financial Future; Rienzie Biolena, founder of Wealth Arki and Consultancy; David Isaiah Angway, founder of WinLongTerm Financials; Ryan de Vera, founder of Wealth Builder Asia; Richard Carvajal, bestselling author of The Millennionaire; Jeremy Jessley Tan, columnist at Manila Times; and Kendrick Chua, host of Chinoy TV. Aside from the forum, there will also be a panel discussion where the audience can participate and send in questions. Tickets are priced at Php5,000 but interested participants can still buy tickets at the pre-event promo price of Php2,500 until Friday, March 23, or until supply lasts. “The goal of becoming financially fit is to have the freedom from financial stress. When you have freedom, you can also achieve happiness in life,” the Financial Planners Philippines said in a statement.